Exploring the world of craft beer and brewing with beer gadgets, pictures, reviews, news, discussions, insight, events, travels, and more. The post A Natural History of Beer appeared first on Craft Beer Time. You wait and wait and finally the time comes and goes too quickly. Limited release beers are lovely but often gone too soon. Wouldn’t you love that brew to be available all the time? Here’s why you may not want your favorite limited release/seasonal beer to become year-round. Though the life of limited release beers is often far too brief, there are lots of positive thing about those that come into our lives but leave too fast. The craft beer world has become very focused on the next new thing. The newest releases of the month, the newest breweries in town, the newest popular styles. When a beer is a limited release, or even seasonal, it still retains that newness craft beer fan fawn over. This has a number of positive effects on the beer and drinker. First, that newness and limited availability help move product. You know you’re getting fresh beer because it’s only been out for a short time and limited/seasonal releases tend to sit on the shelves for far shorter periods of time than year-round brews do. Items that are limited (including seasonals) also have a positive phycological impact on our overall enjoyment. Studies have shown that we not only value things that are limited more than the less-rare, but the enjoyment center of our brains light up brighter when we consume them. This means we may actually gain more pleasure from drinking a seasonal beer than a year-round one. The simple act of making a limited-release beer year-round may be enough to cause us to feel less enjoyment from it, even when nothing else about that beer has been changed, besides the release schedule. As much as there are advantages to remaining limited or seasonal, there are disadvantages to going year-round too. They could sadly lead to you falling out of love with a favorite. While limited availability beers tend to sell quickly, year-round often sit on the shelves for longer periods of time. People know they can get them anything they like, so they go for the limited stuff they may miss out on instead. This leads to product sitting on the shelf for longer. While a good liquor store and distributor should take care of anything past date-code, that doesn’t mean the beer is as fresh as can be. With styles that are better as fresh as possible (IPAs for example), even the difference between a week and a month can be noticeable. With year-round product sitting longer, you may find you enjoy the brew less than you did before it became more available. We’ve all done it. We see that awesome year-round beer on the shelf (maybe it’s an old favorite or the one that turned you on the craft in the first place) but then find ourselves buying the brew of the moment instead. “I’ll buy this one because I can only get it for a limited time, while those others I can get any time.”, you justify to yourself. The problem is there’s always a new limited release, and you never/rarely return to those year-round offerings. You’ve just gone from buying a beer in as large of quantities as possible when it’s a limited release, to rarely (if ever) buying it when it becomes easily available. It’s sad that seasonal and limited release beers are only around for a short time but there are downsides to becoming year-round that may be worse than limited availability. Part of the magic of these beers is their limited availability. We shouldn’t be crying about it, but rather celebrating it. Enjoy the limited/seasonal releases while you can and don’t always wish you had more. Being year-round may not be awesome as you think. And when you run out, be sure to grab one of the many amazing year-round brews you haven’t had in a while. The next limited-release will be out soon enough. The post Why You Might Not Want Your Favorite Limited Release Beer To Become Year-Round appeared first on Craft Beer Time. The post Squirrel Stash Nuts Buzzed Craft Beer Roasted Cashews appeared first on CraftBeerTime.com. Craft beer fans love to rock brewery gear. Sweet shirts that show our love of local beverage. Want to expand your beer wardrobe with ease? 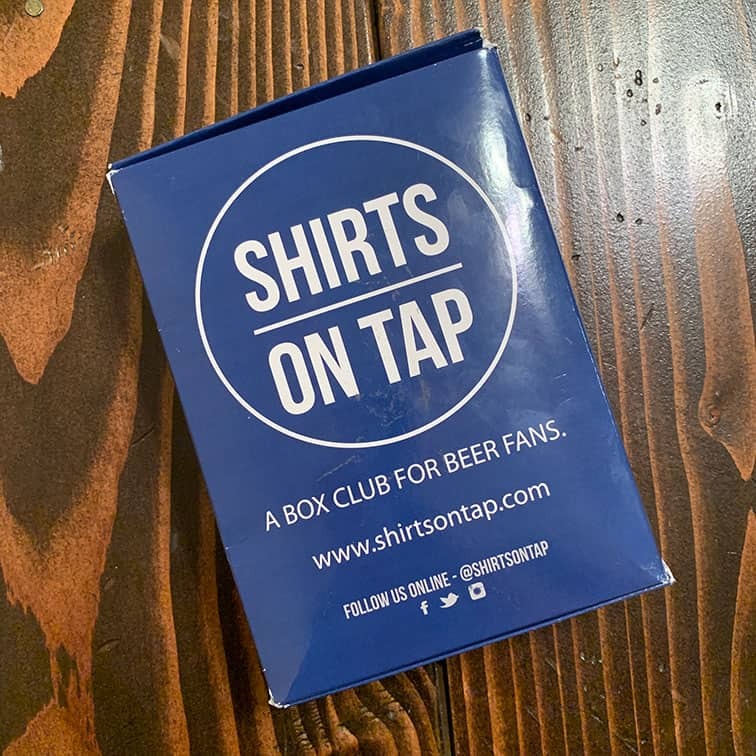 Shirts On Tap is a box club for beer fans. 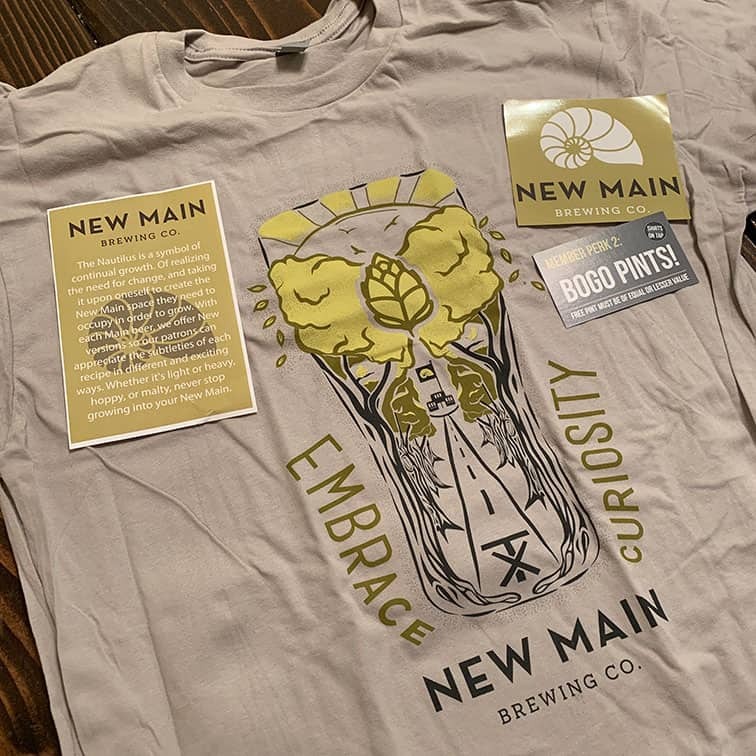 Who doesn’t want an awesome new brewery shirt in the mail each month? Shirts On Tap delivers that and more. 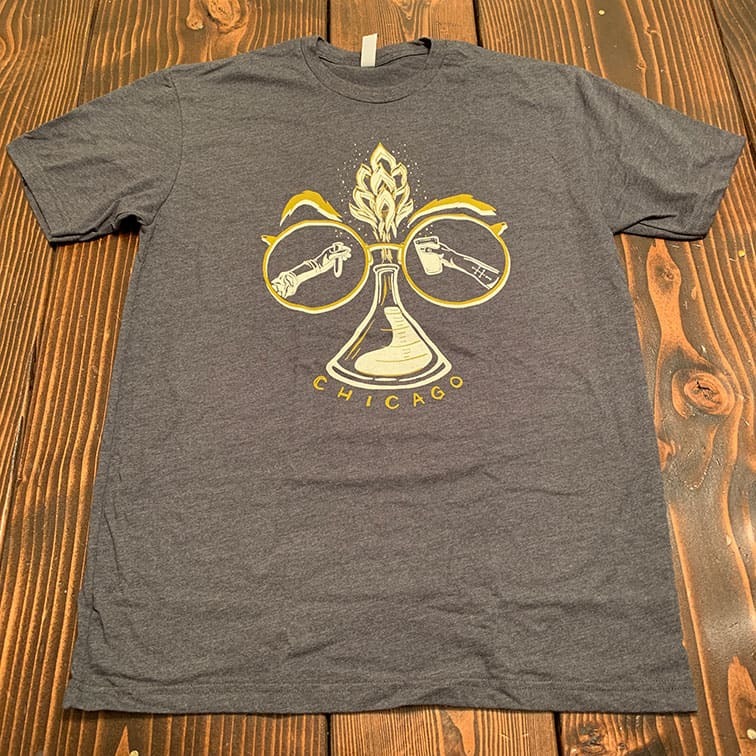 Subscribers can pick from 6 different cities to receive brewery shirts from (more cities are on the way) or receive a shirt from a random city each month. You can pick from a number of styles for both women and men (heavy or soft cotton t-shirts, tank tops, v-necks, and more). In addition, you also choose if they want the logo on the font or the back of the shirt. 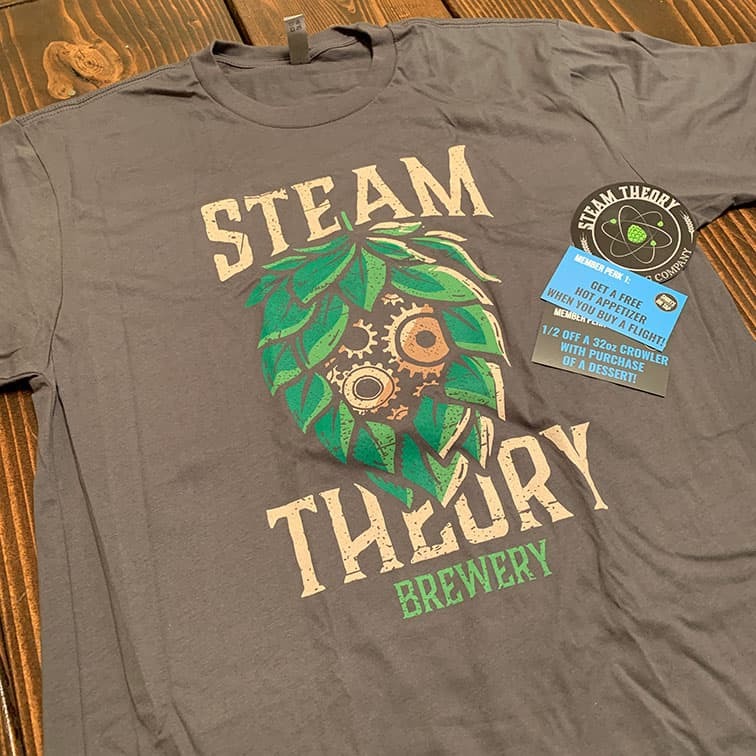 In addition to a brewery shirt, each shipment comes with a bit of information about the brewery of the month, so you can learn more about who’s gear you’re rocking. That way, even if you haven’t been to the brewery, you won’t look like a total poser if people ask about it. But truthfully, no one will judge you for wearing a shirt to a brewery you haven’t been to. A Goose Island employee asked about my Empirical Brewery shirt when we ran into each other at a local bar on Thanksgiving night. When I said I hadn’t been, he told me how awesome they were, then bought me a beer while we chatted. 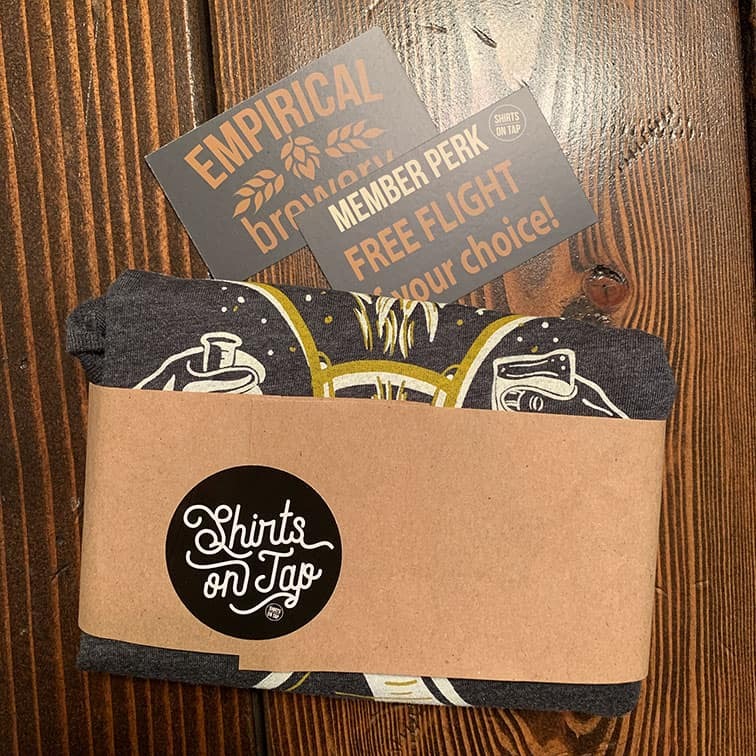 Your Shirts On Tap shipment also includes coupons to the brewery, good for free pints, free flights, discounted food, merchandise, and more. Now you’ve got a sweet shirt and an awesome reason to go check out the brewer featured on it. They also throw in stickers. Growing your beer gear is easier than ever with a subscription to Shirts On Tap. It’s a great way to get new shirts, learn about new breweries, and grab great discounts. Go check out all the awesome shirt subscriptions available from Shirts On Tap now. Get your first box for just $5 when you use the discount code BEERBREWIN at checkout (normally $18). The post Shirts On Tap Box Club For Beer Fans appeared first on CraftBeerTime.com. Just because it’s cold outside doesn’t mean the outdoor drinking is done. With the right gear, you can keep enjoying beer outside all year. The 686 Men’s Sixer Beer Jacket is perfect for keeping you warm and the beer cold. No matter where outdoor winter adventure takes you, cold beer is a must. That’s why the 686 Men’s Sixer Beer Jacket features special pockets for packing plenty your favorite brews. This thing has all kinds of beer pockets! 10 in total. That means you can carry a full 12-pack of 12oz or tallboys (you carry one in each hand too, right?). 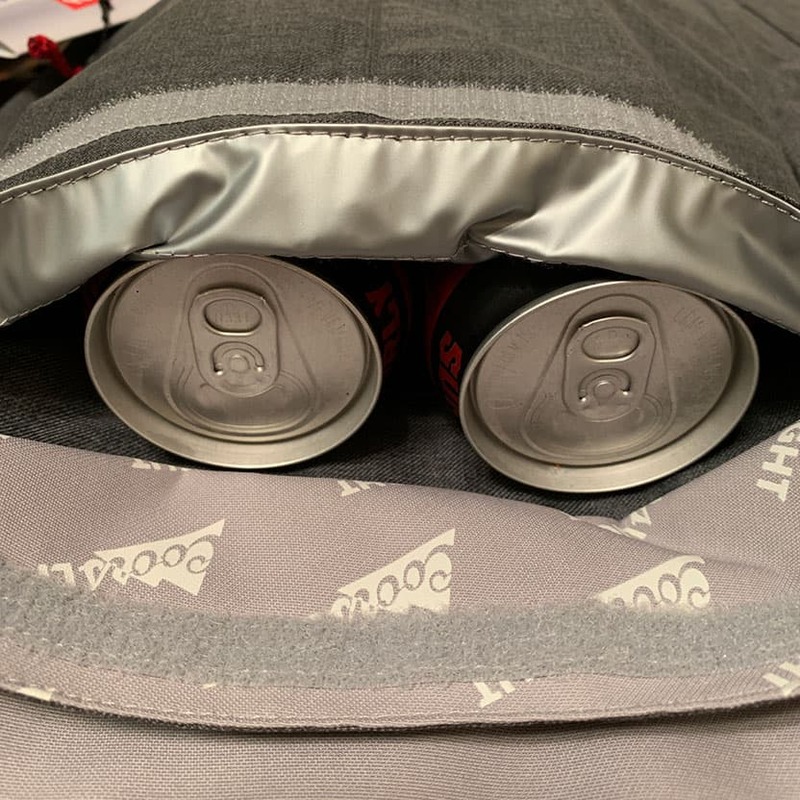 The three front and one inner pocket are insulated, keeping you warm and your beers cold. 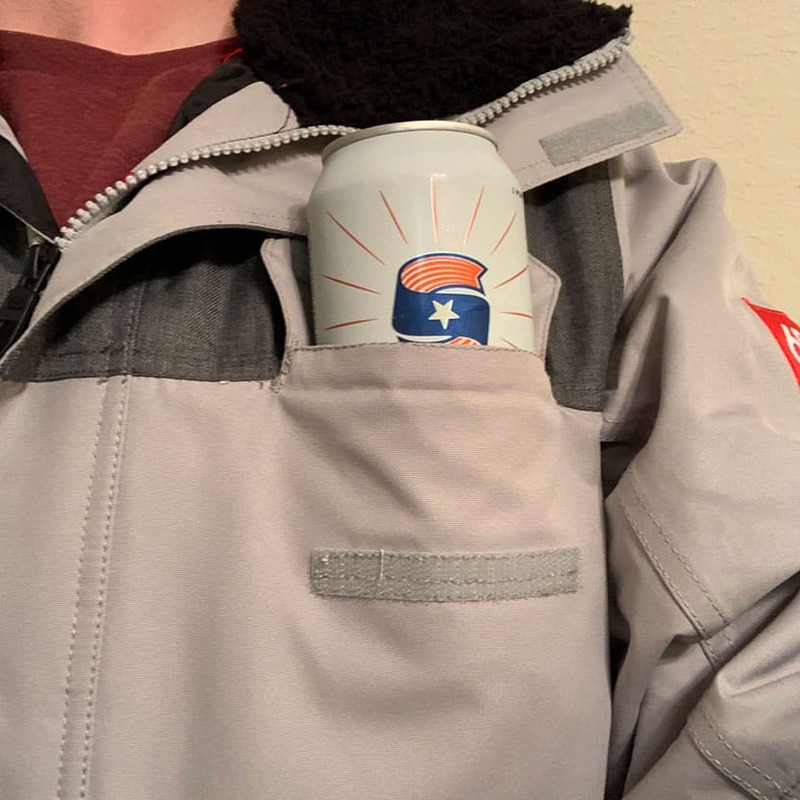 With beer pockets inside and out, there’s somewhere to stash beer everywhere you look. In addition to places to put a brew, the 686 Men’s Sixer Jacket also has lots of awesome features for any outdoor enthusiast. It’s waterproof but also breathable, warm but not heavyweight. Get too warm? There are Air-Flo mesh lined underarm vents you can open to help cool down. The thumb-hole lycra wrist gaiters keep your hands warm when not rocking gloves and make gripping a beer easier. Along with the adjustable cuff, they make keeping sleeves in place simple. Inside, there’s a pocket for your smartphone that allows you to operate it through the clear plastic. It’s accessible from both inside the coat and out, so getting at your device is easy. Earphone loops in the collar keep your earbuds within easy reach, and prevent them from getting tangled. This jacket has everything you need to attack the winter, packing all you need along for the ride. Winter weather is here and it’s time to keep the party going outside. With the 686 Men’s SIxer Beer Jacket, you can be ready to play outside and have plenty of beers too. Pack some brew and head out for some fun. 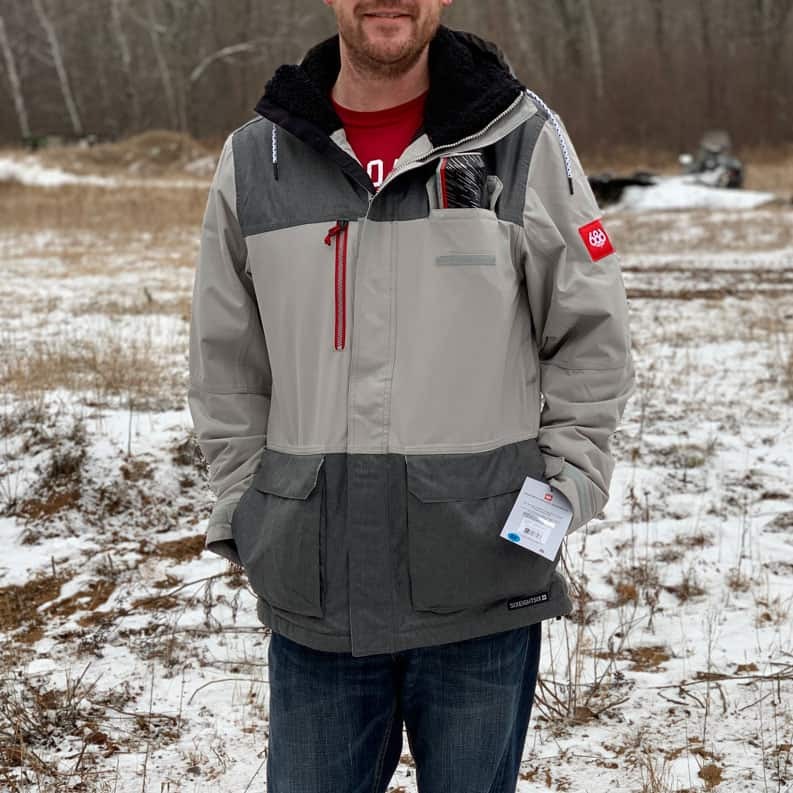 Head over to the 686 website to check out the Men’s Sixer Beer Jacket and all the other great snow apparel they have to keep you warm all winter long. 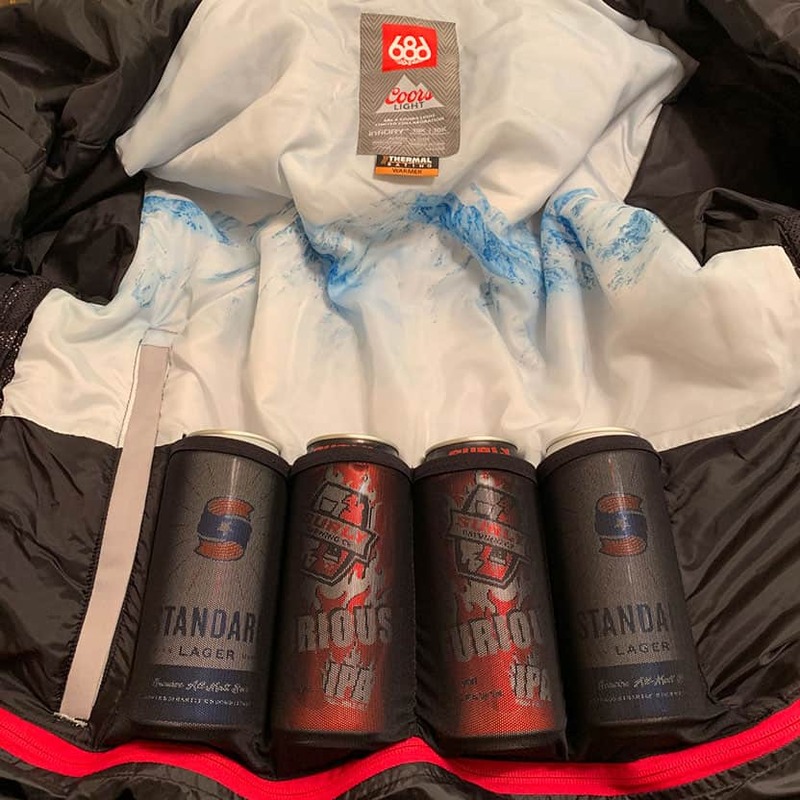 The post 686 Men’s Sixer Beer Jacket appeared first on CraftBeerTime.com. A good Boy Scout is always prepared and so is a good beer drinker. Bottle opener always at the ready, it never hurts to be prepared for more than just brews. The HexFlex Multi-Tool is a beer bottle opener and more. Bottle openers don’t have to be a single function gadget. The HexFlex Multi-Tool packs a bottle opener and tons of other functionality into a tiny package. Even with all that functionality, it weighs only 2.3 ounces and is just over 2″ in diameter, making it small enough to put on your keychain or coat. It’s great to carry a bottle opener but even better to carry a tool that can meet all kinds of additional needs. The HexFlex is available in standard or metric sizes and a variety of finishes, metals, colors, and anodized styles. No matter your needs, they’ve got one to fit them. For those looking for a tiny tool to assist in all types of situations (including opening your beer bottle, of course), the HexFlex Multi-Tool is a great gadget to carry. It packs a ton of utility into a small tool and comes in handy all the time. Head over to the HexFlex Multi-Tool website now and check out the great selection of different options to personalize this powerful little tool. The post HexFlex Multi-Tool Bottle Opener appeared first on CraftBeerTime.com. Put two of Minnesota’s best brewers together and you know you’re going to get something special. This twosome is known for their brewing badassery, so it should be no shock that the Fair State Coop and Barrel Theory collaboration Mr. Falcon is fantastic. When it comes to hazy IPA street cred, these two have it covered. From Barrel Theory with their Rain Drops, Shooter McGavin, Boat Shoes, and more, killing it, to Fair State Coop with Mirror Universe, Spirit Foul, and others crushing it, they’ve certainly shown their ability to brew the style (and any other beer style too). Available exclusively at Zipp’s Liquor in Minneapolis in 4-packs of tallboy cans, and a limited amount to crowlers out of the Fair State Coop taproom in NE Minneapolis, Mr. Falcon is a double dry-hopped IPA packing a big hop punch. Citra, Strata, and Simcoe Cryo hops are kings of the castle here. Simcoe has long been a favorite but appears in cryo-hop form here (do some of you still pickup cat-piss aroma even in the cryo-hop equivalent?). Citra has become one of the hop-head hits in recent years, and Strata is a recent darling of many, after being first bred in 2009. Wow, do they make a combo. You can smell the juiciness from the start. Smooth tropical aromas, light peach, mango, and crushed ripe pineapple. Take a sip and you’re about to get bowled over. Suddenly, this silky-smooth brew hit with a hogshead of hops (sorry, it’s not literally 54 imperial gallons but just know it’s a lot of hop flavor). Tropical abundance with ripe pineapple, light mango, touch of tangerine, and a bit of marijuana green. The mouthfeel is silly smooth. These two really have the water profile dialed in to be able to create that NE-style smoothness, haze, hops, and delicious drinkability. Did you read what I wrote above? What’s not to love? The Barrel Theory boys and Fair State folks collaborated to bring about a delicious drink that any hop head would go head-over-heels for. They certainly succeeded. I’ll have another please. Keep ’em comin! The post Fair State Coop and Barrel Theory Mr. Falcon Collaboration appeared first on CraftBeerTime.com. Everyone knows the pain of stepping on a LEGO® brick. Though kids generally seem impervious to it, nearly every parent knows the pain. As adults, at least we can do something to numb the pain. Green Terrain New England Style IPA from Junkyard Brewing will soothe things. Forget those little brick bastards, Junkyard Brewing packs Green Terrain New England Style IPA with a wonderful combination of Azacca, Mosaic, and Calypso hops. The hop combo creates soft notes of melon and a tropical fruit in the nose. Take a sip and your tongue is met with tons of tropical fruit up front, with notes of pineapple and orange zest standing out. The mouthfeel is soft and the malt balances things nicely, but the hops quickly overtake. A long bit of herbal bitterness and green hop flavor last long on in the aftertaste. Big hop aroma and flavor, soft and easy drinking, Junkyard Green Terrain is a deliciously draining New England style IPA. The fine folks at Junkyard Brewing keep cranking out wonderful beers and doing a killer job at the NE-style IPAs. It’s also far far better than stepping on a plastic brick. The post Junkyard Brewing Green Terrain New England Style IPA appeared first on CraftBeerTime.com. Non-alcoholic craft beer continues to grow and is expected to be a $25 billion market by 2024. 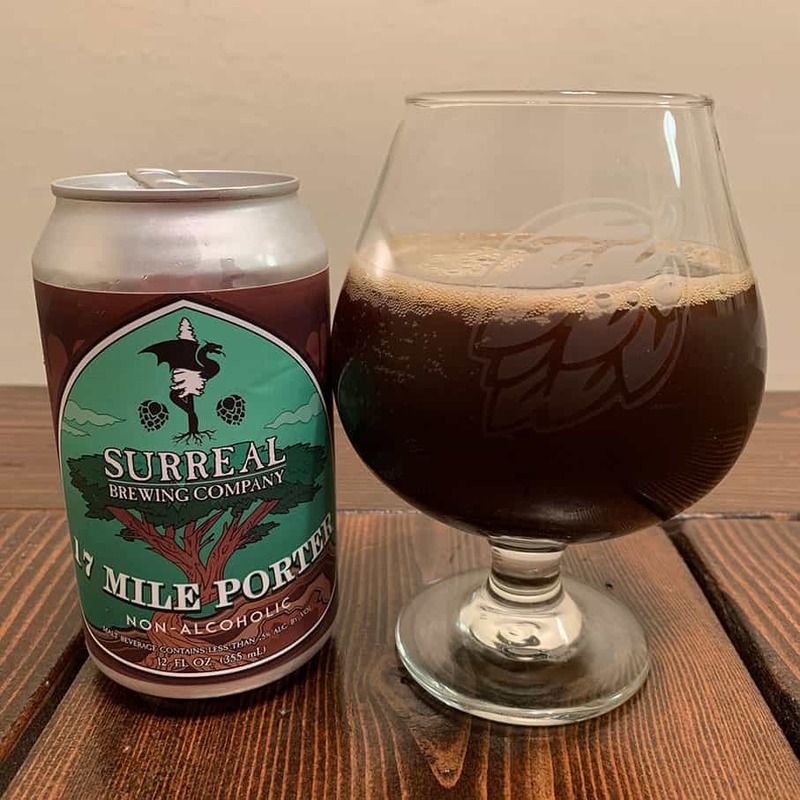 With more breweries brewing NA options, Surreal Brewing Company is offering two great beers for any fan of good brew without the buzz. Non-alcoholic beer isn’t new, but up until recently, the options just weren’t there. Now craft brewers have jumped in to offer great tasting beer without the alcohol. Surreal Brewing Company offers two for those that want full-flavor without the buzz. 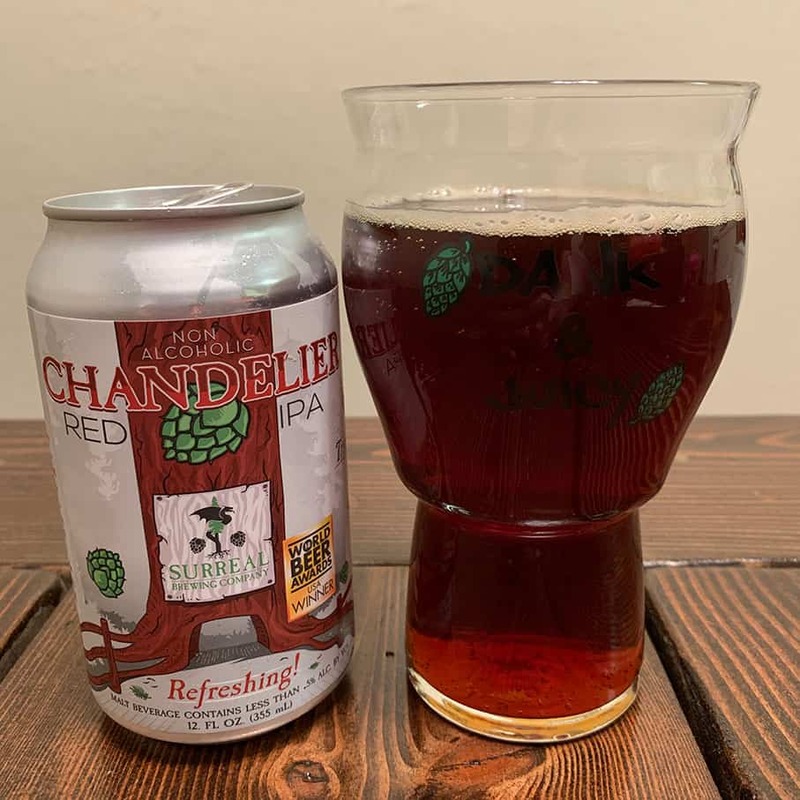 Chandelier Red IPA pours a deep clear mahogany with a small head of white foam atop, which dissipates fairly quickly and leaves a bit of lacing on the walls of the glass. Aroma of rich amber and caramel malt, with a slight sweetness in the nose. Taking a sip, you find slightly sweet caramel malt up front, with a smooth toasted malt body backing it. A hint of fruity hop bitterness, with notes of citrus and light peach. The body is a bit thin, though it makes this beer very easy drinking. Alcohol and residual sugars are where most of the calories in beer come from. While craft beers often weigh in at 200 calories or more per 12oz, non-alcoholic beers tend to be far less calorically heavy. Chandelier Red IPA has only 45 calories per can. Enjoy a few without the guilt that you’re throwing your diet off course. This porter pours a murky brown with a small tan head that settles, leaving just a ring around the edge of the glass. Aroma of roasted grain and a hint of coffee in the nose. Dark chocolate malt and a touch of earthy hops before big coffee in the aftertaste. It’s almost as if fresh coffee grounds were added right to the malt bill or post-fermentation. Body is a bit thin but that again is something alcohol normally helps to build. Easy drinking and coffee-kicking. Non-alcoholic beer is growing and the awesome options available continue to expand. Surreal Brewing Company has two great beers without the buzz and more to come. If you’re looking for full-flavor without the downsides of alcohol, check out their innovative non-alcoholic brews. If you’d like to learn more or order non-alcoholic craft beer, head over to the Surreal Brewing Company website now. The post Surreal Brewing Company Non-Alcoholic Beer appeared first on CraftBeerTime.com. Non-alcoholic beer doesn’t have to taste like water. There’s a new breed of craft breweries creating full-flavored options without the alcohol. WellBeing Brewing Company shows that you can have plenty of flavor, without the hangover. Normally, non-alcoholic beers have been made one of two ways. Either they stop fermentation before much alcohol is produced, or they take the fermented beer and heat it, to boil off the alcohol. Both negatively impact the final product, resulting in beer that’s thin, watery, and often has a bad aftertaste. WellBeing Brewing Company takes a different approach to non-alcoholic. They use technology to put the finished beer into a vacuum and lower the boiling point, to gently remove the alcohol. The finished product maintains the aroma, body, flavor, and mouthfeel you expect in a great beer. Based on a GABF award-winning recipe, Heavenly Body Golden Wheat has a light sweetness in the nose with a touch of herbal hops. The body is medium-light, with a nice balance of wheat and a touch of citrus hop character. It’s light, easy drinking, and crisp. The mouthfeel is what you’d expect from a light wheat beer. Not at all thin like some non-alcoholic beers can be. I’d never guess it was non-alcoholic. No hangover or DUI aren’t the only advantages of non-alcoholic beers. They also pack less calories and sugar than their fully-fueled friends. 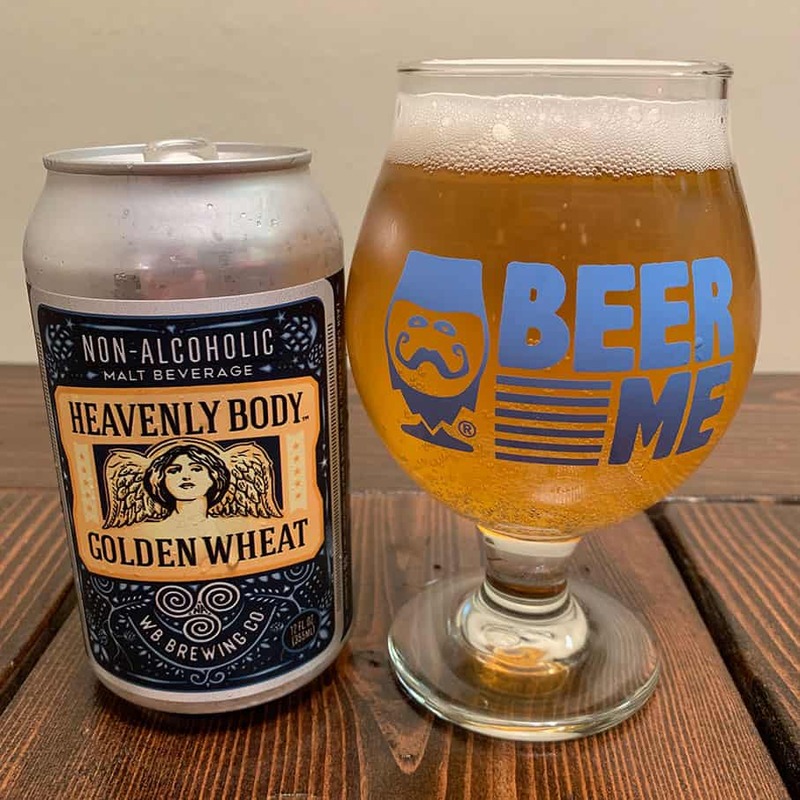 Heavenly Body Golden Wheat has just 68 calories (compared to the 200+ found in most craft beers) and no sugar. You can consume it post-workout or anytime, without worry. This dark amber ale has aromas of toasted golden malt and fruity hops. From the first sip, you’d never know it’s non-alcoholic. Medium caramel malt with a light toastiness balanced by a great floral hop flavor. A touch of hop spiciness and plenty of fruity hop notes in the aftertaste. It’s really well balanced and easy to drink. 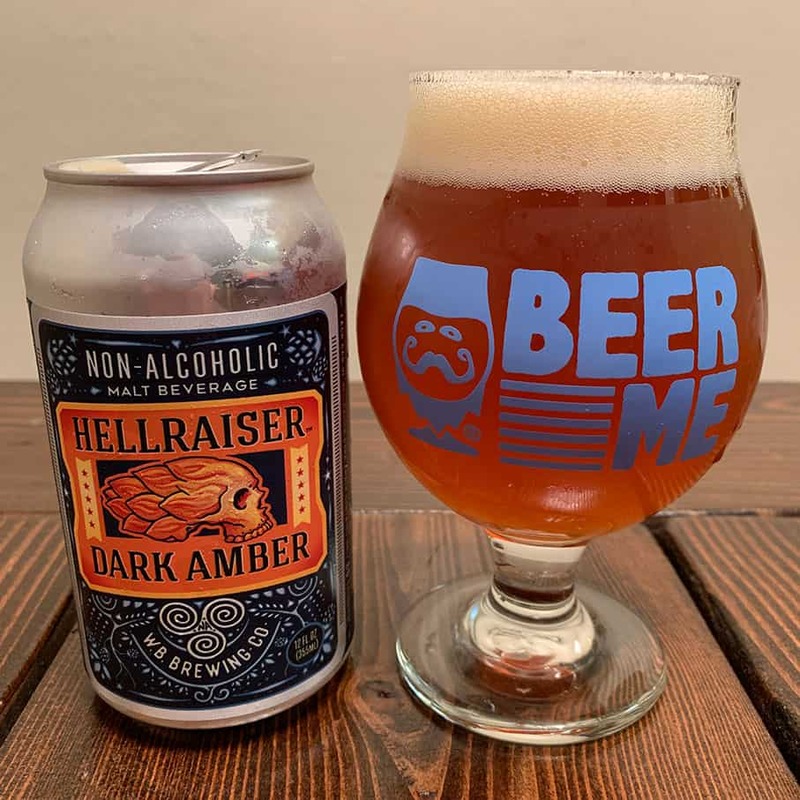 This beer makes you give up nothing to enjoy a delicious amber ale. At only 80 calories, you can have a few. Non-alcoholic craft beer just keeps getting better. 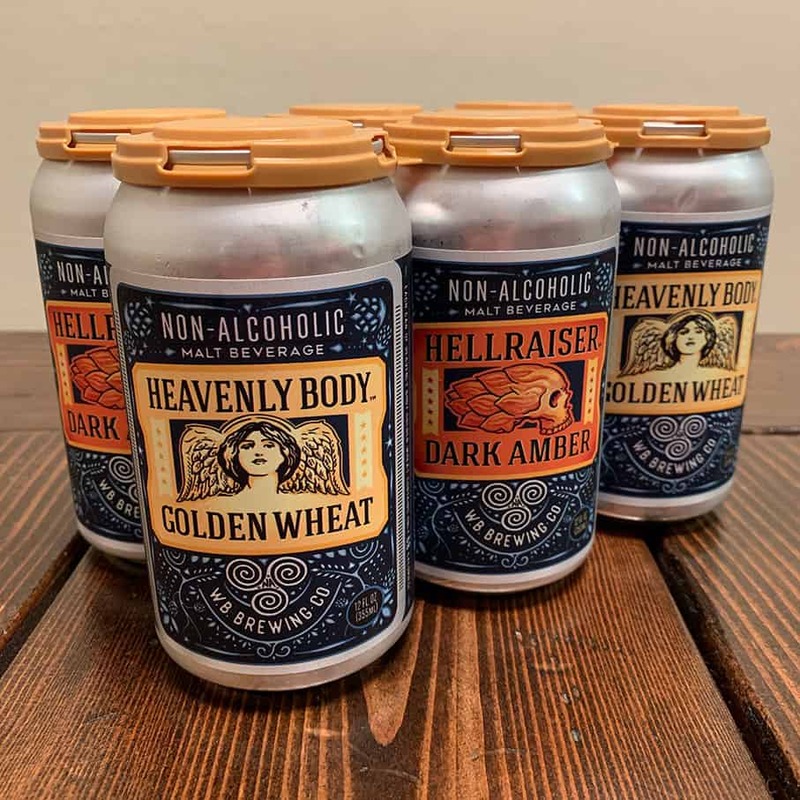 You no longer have to give up flavor along with the alcohol, as WellBeing Brewing shows with Heavenly Body Golden Wheat and Hellraiser Dark Amber. It’s full-flavored and delicious drinking that doesn’t leave you longing for the missing ingredient. Order WellBeing Brewing non-alcoholic craft beer on their website now and see what you’re not missing without the alcohol. The post WellBeing Brewing Company Non-Alcoholic Craft Beer appeared first on CraftBeerTime.com.